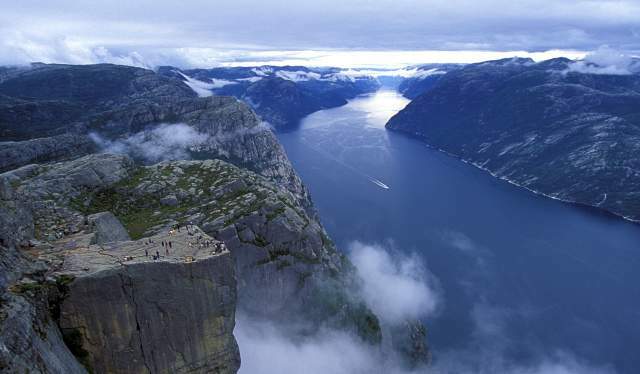 Preikestolen (The Pulpit Rock) towers 604 metres above the Lysefjord and the hike up is one of Norway’s most famous mountain hikes. The interest in Preikestolen increases each year and in 2017, more than 300,000 nature-loving hikers visited the renowned rock formation. Preikestolen (The Pulpit Rock) towers 1,981 feet above the Lysefjord and the hike up is one of Norway’s most famous mountain hikes. The interest in Preikestolen increases each year and in 2017, more than 300,000 nature-loving hikers visited the renowned rock formation. Good hiking boots are recommended. Some parts of the hike go across rough terrain, and you will need ample foot and ankle support. There are occasional strong gusts at Preikestolen, so please use wind and waterproof outerwear. An extra set of clothes including a cap, a scarf, and gloves or mittens belong in your backpack. The hike starts at Preikestolen fjellstue mountain cabin, and you can get there by car and boat. There is also a bus service from Stavanger. If you drive from Stavanger, you can take the ferry from Stavanger to Tau, and then drive to Preikestolen fjellstue via Jørpeland on Rv 13. If you travel from Sandnes, you can take the ferry from Lauvik to Oanes and drive up to Preikestolen fjellstue from there. 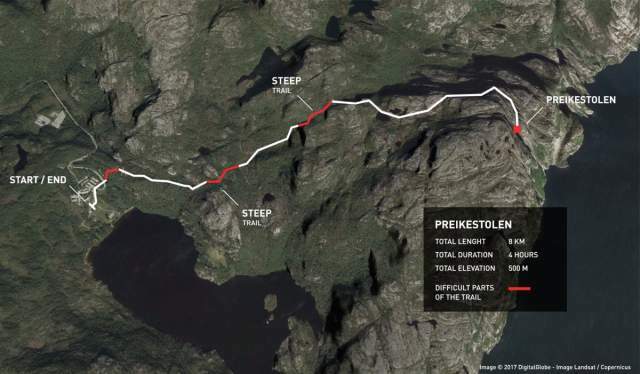 Check out more options for getting to Preikestolen. There are many other hikes around Preikestolen and in the nearby areas, including easier options. Check out the hiking alternatives in the area.